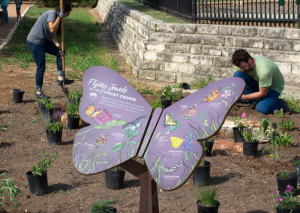 HCC hosts several events throughout the year to promote its mission of conserving and preserving open spaces, scenic vistas, and natural habitats. EPIC events are generally for members only. If you are interested in volunteering beyond the opportunities listed, please contact us. Violet Crown Trail – Spyglass Trailhead, 1599 Spyglass Dr.
Help us clean up the Violet Crown Trail in some of the spots where folks leave behind their trash - this is a great opportunity to get involved on the VCT. We will spend 1.5-2 hours cleaning up and enjoying a hike. 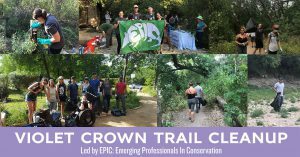 Violet Crown Trail – Gus Fruh, 2642 Barton Hills Dr.
Help us clean up the Violet Crown Trail in some of the spots where folks leave behind their trash - this is a great opportunity to get involved on the VCT. We will spend 1.5-2 hours cleaning up and enjoying a hike. Location: ZILKER TRAILHEAD | 2131 WILLIAM BARTON DR WEATHER: If this event needs to be cancelled or rescheduled due to rain, we will send an email 12 hours before the event. Due to forecasted thunderstorms, this trail cleanup has been cancelled. Check back for other opportunities to get involved on the trail! Join members of Emerging Professionals In Conservation (EPIC) as we clean up the Violet Crown Trail (VCT) in some of the spots where folks leave behind their trash. This volunteer opportunity is open to anyone, and is a great way to get involved on the VCT!